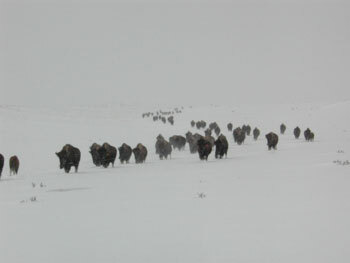 Howdy and Welcome to Silver Sage Bison! We are located in eastern Wyoming. While the mailing address is Lusk, Wyoming we are actually about 50 miles out of town. The ranch is a working buffalo and cattle ranch, owned and operated by us, Stan & Claudia. The land here is referred to as “short grass prairie.” Average rainfall is in the 14 inches per year category. That’s why the grass is “short”, which generally means less than 12 inches high at maturity. While not particularly tall, the grasses found here are extremely nutritious. 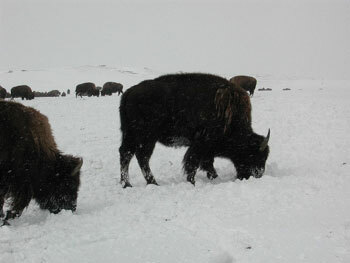 It is an ideal place for grazing animals such as buffalo and cattle. The quality of livestock that grows in this region is well known throughout the livestock industry today. But, even in prehistoric times our local area was well known by native people as producing outstanding game animals in great quantity! This was a traditional destination for Indians of the Great Plains when they were looking for somewhere to conduct fall hunts and set up winter camps. The many “teepee rings” in the immediate area are a testimony to the popularity of the area, some of which can be found within a very short distance of our house.